86 Value For Money Better Options? If you own Apple iPad Pro WiFi + Cellular 128GB, please do leave your feedback too. The Apple iPad Pro WiFi + Cellular 128GB is a 12.9 inch tablet. It has an LCD display bearing a 2732 x 2048 pixels resolution, that translates to a pixel density of 264.7PPI. This tablet has a Apple A9X chipset which houses a Dual-Core processor. It is clocked at 2.2GHz and is coupled with 4GB of RAM. It runs on the iOS operating system. Details about the OS that it ships with are: unknown. The internal storage of Apple iPad Pro WiFi + Cellular 128GB is 128GB. If you're wondering about the ability to expand storage via a microSD card slot, the answer is No. The resolution of the rear camera is 8MP, whereas the resolution of the front camera is 1.2MP. The video recording capability of the camera is Full HD Video Recording (1080p). 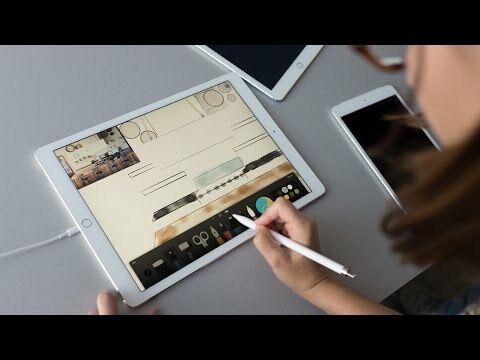 In terms of connectivity, the Apple iPad Pro WiFi + Cellular 128GB supports the following: 4G, 3G, 2G, WiFi, Bluetooth. For charging and data transfer, this device sports a Apple Lightning connector. To connect headphones or speaker to this tablet, the port is 3.5mm. The dimensions of this tab are 305.7 x 220.6 x 6.9 millimeters, while its weight is 723grams. Powering this tablet is a Lithium-Polymer (Li-Po) type battery and its capacity is 10307mAh. Lastly, No is the answer to the question "Does this tablet have a calling facility?". Lastly, the lowest price of Apple iPad Pro WiFi + Cellular 128GB is in India today.